The Lake Geneva Jaycees donated new equipment to myTEAM TRIUMPH Wisconsin Chapter. This very energetic group, is an athletic mentoring program created for children, teens, adults and veterans with disabilities who would normally not be able to experience endurance events such as triathlons or road races. myTEAM TRIUMPH brings the community together with the equipment necessary to allow them to experience the energy of packet pick-up and the thrill of crossing the finish line. myTEAM TRIUMPH promotes health, teamwork, and community, and requires the involvement of many people with diverse abilities and disabilities. 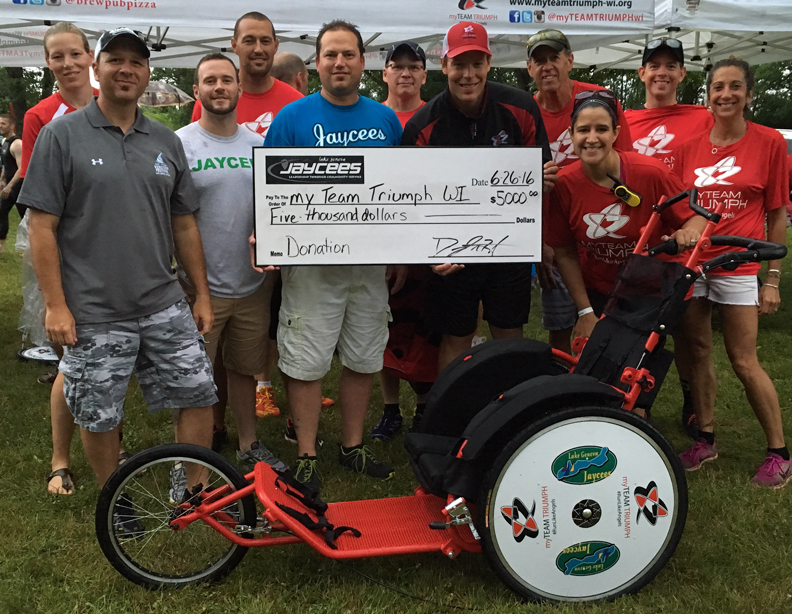 The Lake Geneva Jaycees were proud to be at the Big Foot Triathlon to see the donated equipment in action! The Lake Geneva Jaycees are proud to support the community and giving back to the future of our community in efforts such as these. The Jaycees hold several fundraising events every year, in the Lake Geneva in order to do just that.